A catalog and technical reference website for a national turntable tonearm distributor. A national distributor of audiophile electronic parts had an older site with a fixed width layout, and a standard WordPress install with posts and page data types. The site needed to provide some custom displays of high end tonearms, and also provide an index of dealers and service shops. Assistance was also needed with search engine optimization. An HTML5 mobile responsive theme was created using the Twitter Bootstrap CSS framework. 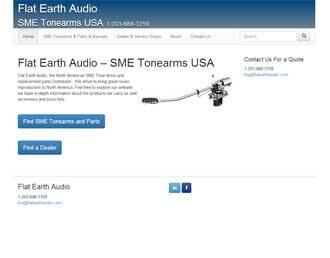 Custom post data types were created for the tonearms and dealer information pages. This allowed the client to create seo tagged images, title, content, links to tonearm services sheets, and instruction manuals. Dealer and service shop information was given SEO treatment. A fast, mobile responsive web design based on the WordPress CMS had been created. The client can easily add SME Tonearm data, and dealer information through dedicated Admin pages in the Dashboard. Customers requiring SME turntable tonearms will be able to find specifications and dealers via the Flat Earth Audio website.